Well, here it is at last. I was having a hard time getting going. Further self-reflection in my first comment. There is a lot of research on walkability: what it means, how it affects urban design, and how it helps people. Much of this research attempts to quantify and set objective criteria for walkability. This paper explores the both the objective and subjective criteria of what makes a neighborhood walkable. The objective criteria for walkability, applied as a set of rules, do not necessarily make for a lively neighborhood, in the sense Jane Jacobs discusses in “The Death and Life of Great American Cities” (1961). In exploring two highly-walkable neighborhoods in Seattle, we found one much livelier than the other. A greater synthesis of elements is needed to bring a neighborhood from walkable to lively. Walkability is a very trendy topic. It’s supposed to help us mitigate the problems of peak oil, fight obesity, make us better neighbors, raise our property values, and improve our neighborhoods. Most cities in the US after World War II were designed for the car; now, the foot is all important. There’s a lot of research, and a lot of marketing. But what is walkability? What does it mean for a neighborhood to be “walkable”? The purpose of this paper is to explore both the objective and subjective criteria of what makes a neighborhood walkable, in order that the reader can personally assess walkability. What makes a neighborhood walkable? We examine this question in several ways. First, by looking at definitions of walkability as used by researchers in the subject. Second, we look at the role various elements play in walkability. Third, we explore the aesthetics of walkability, with a physical exploration of two Seattle neighborhoods. The neighborhoods were chosen because (a) they both had very high walk scores, as rated by walkscore.com and (b) they represented two different approaches to walkability. The Denny Triangle, rated Seattle’s most walkable neighborhood (“Walk Score: Seattle, Washington 2011,” 2011), experienced heavy redevelopment aimed at becoming an urban center (“Development Project Database,” n.d.). Ballard, Seattle’s fifth most walkable neighborhood (“Walk Score: Seattle, Washington 2011,” 2011), also experienced redevelopment during the 00s, but much less drastically. The current emphasis on walkability is trying to recreate or restore a state of existence that used to be a matter of course. As Michael Southworth, Professor of Urban Design and Planning at University of California – Berkeley points out (2005), “Cities of the middle ages were remarkable in their walkability and typically packed all the necessities of urban living into an area no more than 1/2 mi from the central square.” Up until the 19th century, even very densely populated cities remained small enough to walk across in an hour, about three miles (Soderstrom, 2009). The automobile and the post-World War II boom only worsened things in North America. The 1956 Interstate Highway Act provided escape routes from cities and paths for development. 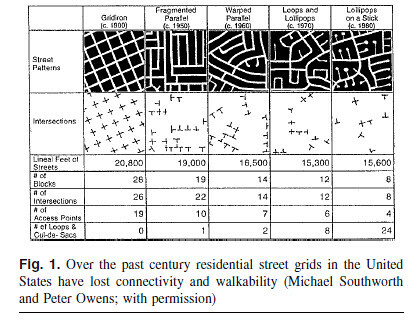 (Soderstrom, 2009, p. 176) Street design evolved from a heavily-connected gridiron to unconnected cul-de-sacs. (Southworth, 2005, fig. 1). What they all have in common is that walkability is a choice we can make in our cities and how we design them. Just as there have been many attempts to define walkability, there is a vast array of criteria to consider for walkability. The criteria proposed by many people have a great deal of overlap, but not every feature is applicable to every neighborhood; some might even conflict in a given use. Because there are so many individual criteria, no sooner does someone write a law of walkability than someone else can find a lively street that violates that law (Southworth, 2005, p. 254). The criteria for walkability can be summarized as: a dense street grid, with short blocks and many intersections; access to different kinds of transportation; grocery stores, restaurants and bars, and daily retail close by. With these elements, people will walk more. Things like barriers between the pedestrian and automobile traffic (eg, parking or a planting strip); wide, flat sidewalks; street furniture for resting or visiting, are helpful to the aesthetic experience but not necessarily to the actual decision to walk. Walkscore.com calculates walkability using an algorithm based on a thorough understanding of walkability research. Using mapping data from various sources, Walkscore takes an address and maps out the closest of each of nine different amenity categories, such as grocery, restaurants, shopping, coffee, banks, and so on. Each of these categories receives a point value, depending on how important the amenity is to promote walking. In categories such as restaurants, where choice is important, the point value is split up to provide a count. For instance, a grocery store in walking distance is very important, but people only need one. So, grocery gets three points but only one count. People like to have numerous restaurants nearby, so the restaurant category gets ten different counts that add up to two. These counts are combined into a walk score that is then compared against criteria such as block length, distance to bus stops, and intersection density. From all this, a final walkscore ranging from 0 to 100 is calculated. Seattle is ranked 6 out of ten most walkable US cities. The most walkable neighborhood, Denny Triangle, has a walk score of 98; Rainier View, the least walkable neighborhood, has a walk score of 22. The district … must serve more than one primary function; preferably more than two. These must insure the presence of people who go outdoors on different schedules and are in the place for different purposes, but who are able to use many facilities in common. But the abstract lists of definitions and criteria might not matter much when weighed against the subjective experience of walking through a neighborhood. I decided to compare two neighborhoods: the Denny Triangle and Ballard. In 2008, the Denny Triangle was not even given a walk score (“Walk Score: Seattle, Washington, 2008,” 2008); in 2011, it ranks as Seattle’s most walkable neighborhood. (“Walk Score: Seattle, Washington 2011,” 2011). Ballard moved from Seattle’s 13th most walkable neighborhood in 2008 to #5 in 2011. Both are fairly old neighborhoods, originally platted in the late 19th century. I picked Denny Triangle because it is Seattle’s most walkable neighborhood and Ballard because I live there. The boundaries of the neighborhoods came from Walkscore.com. Walkscore uses the neighborhood boundaries provided by Zillow. (Herst, 2011) However, I could not find on Zillow’s website how they decided on a neighborhood’s borders. Denny Triangle features the short blocks and grid density that promotes walkability. Until the 1990s, the Denny Triangle was filled with “functional but largely undistinguished structures” (Crowley, 1999a) and was considered a working class neighborhood. Lately, though, it’s been heavily redeveloped, and since 2007, more than $700 million worth of building projects have been completed in this area (Table 1). The streetcar line, which began service in 2007, cost $56.4 million (Lindblom, 2009). The redevelopment of the Denny Triangle ties in with the extensive and controversial redevelopment of South Lake Union (Feit, 2011). The land uses are also quite varied, featuring night clubs, theaters, auto dealerships, Antioch University and Cornish College of the Arts, and office buildings. As of 29 August 2011, I’ve walked through the Denny Triangle twice, exploring different paths as much as possible. These were both recreational strolls, with no particular purpose in mind. I noticed little difference in foot traffic between a weekday and a Sunday afternoon, but I did notice that many of the cafes and restaurants were closed on the Sunday. This removes a great incentive for walking, and for making what Jacobs would call a lively district. Particularly striking was the lack of a perceptible center. There was the Whole Foods grocery store at Westlake and Denny, and between that and the restaurants in the same development there was a lively amount of foot traffic. But even just crossing the street felt like crossing into a wasteland, and there was little or no foot traffic across the street. Nearly every bus route in Seattle that runs east of Lake Union and through the University District filters into the Denny Triangle before heading downtown. This, combined with the streetcar, gives it an excellent transit score. Ballard was incorporated as a city in 1890 and annexed by Seattle in 1907 (Crowley, 1999b). Its street grid features a good number of intersections, but notice that the east west blocks between 65th and Market streets are very long. Downtown Ballard is centered on the intersection of Market St., Leary Way, and 22nd Ave.
Ballard, too, experienced some heavy redevelopment in the 00s, but not nearly as much or as focused as Denny Triangle’s. Ballard’s redevelopment was mostly residential, with condos and apartment buildings. Among the developments was an apartment building with a QFC on its ground floor and Ballard Commons Park. There are several reasons that Ballard is a more pleasant area to walk than the Denny Triangle. First, it has a noticeable center. The intersection of Leary, Market, and 22nd Ave is where the bus lines intersect. It’s close to Ballard Ave. NW, which provides a very different texture for walking than Market St. The sidewalks are wide enough that people can linger without blocking traffic, and there are mature trees along Market west of 22nd Ave.
There’s more to walkability for a neighborhood than meeting the list of walkable criteria. This “something more” makes Ballard more pleasant to walk than the Denny Triangle. Abbey, S. (2005). Walkability Scoping Paper. Cohen, N. (Ed.). (2010). Green Cities: An A to Z Guide. Thousand Oaks: Sage Publications. Herst, J. (2011, August 22). Questions re methodology. Jacobs, J. (1992). The Death and Life of Great American Cities. New York: Vintage. Moudon, A. V., Lee, C., Cheadle, A. D., Garvin, C., Johnson, D., Schmid, T. L., Weathers, R. D., et al. (2006). Operational Definitions of Walkable Neighborhood: Theoretical and Empirical Insights. Journal of Physical Activity and Health, 3(Suppl 1), S99-S117. Soderstrom, M. (2009). The Walkable City: From Haussmann’s Boulevards to Jane Jacobs’ Streets and Beyond. Vehicule Press. This doesn't develop the argument about objective and subjective elements of walkability very well. I got sidetracked by how expensive the redevelopment of Denny Triangle has been. I'd love to see occupancy rates for all those buildings, but the development association website was conspicuously absent on that regard. This is fascinating. First, of course, when I lived in Seattle not only was the Denny Triangle not walkable, there was really no reason to go there, walkable or not. Actually, at that time the same was true of Belltown, but it got upgraded first. Second, although I'm aware subjectively of the evolution of the suburban street pattern as depicted in your illustration, I didn't know the different styles had formal existence, and (hot damn) names. Cool! It's very apparent on a street map, when you know to look for it. Denny Triangle has the gridiron style grid. Ballard has a slightly different gridiron grid. If you look at the neighborhoods with the lowest walk scores, North Beach/Blue Ridge and Rainier View they are very close to the lollipop grid pattern. The street grid doesn't have to be right angles; the second and third style would greatly improve in walkability with more intersections. Thanks, I'm glad you liked it! And, alas for the developers, there really isn't much of a reason to go to Denny Triangle now, either.